New Zealand has a lot of great attractions right throughout the country for locals and visitors to enjoy and one of the more unique ones is The Waterworks Coromandel, a water-themed fun park that’s an absolute one-of-a-kind. What is The Waterworks Coromandel? The Waterworks is a playground with a difference. It’s a five-acre water-themed fun park that includes play areas created largely from recycled materials with water cannons, mini boats, bicycle-powered water-pumps, a water-powered clock and river swimming area. In total, they have over 70+ quirky interactive contraptions that people of all ages can use and enjoy. The theme park is also environmentally focused and has earned a place on the Organic Explorer website. There’s even an awesome flying fox for the thrill seekers to test their nerve! Once you’ve burnt off all that energy, you can have a nice relaxing dip in the swimming hole. Not a bad way to finish the day off! The Waterworks doesn’t revolve purely around water. We’ve already mentioned the flying fox, but there’s a host of other attractions, facilities and amenities that you can utilise and enjoy. These things include the pedal-to-nowhere bikes, human-sized hamster wheel, swings, slides, balance beams and you can even play a game of super-sized skittles! On top of this, there are also campervan parking sites, so if you happen to be travelling in a campervan or one of GO Rentals fancy Glampers you can park up for a few days, enjoy The Waterworks and all the other neighbouring attractions and sights in the region. The Waterworks is not a place you’ll go hungry as they have a great café onsite as well as picnic areas and free gas BBQs all over the park. The café is a local’s favourite, with indoor and outdoor seating, locally sourced produce, Organic Lala Coffee, incredible thick shakes and a great variety of ice creams and fruit smoothies, perfect for a hot summer’s day. From Auckland, take State Highway 25 along the west coast of the Coromandel Peninsula from Thames for about 50 minutes. The Thames Coast road is one of the most scenic roads in New Zealand. About 4 km before you reach Coromandel Town turn right onto the “309” Road and follow the signs about 5km to The Waterworks. There are a number of things to see in the region to turn this short road trip into a bigger one. These include the Castle Rock lookout, Waiau Falls, a spectacular Kauri stand, Koru Cottage (which offers tranquil, relaxed accommodation) and the 309 Honey Shop. For more ideas of things to do in the Coromandel, make sure you check out our Complete Guide to the Coromandel which is packed full of great ideas of things to do and places to GO. Plan a day out at The Waterworks Coromandel! Hopefully, this read has inspired you to plan a trip to The Waterworks Coromandel, whether you’re a visitor in New Zealand on a holiday or a local looking for a decent day out, we’re confident you won’t regret it! Entry costs $22.50 for adults, $18 for children 3- 15 years, students and senior citizens. Toddlers under 3 years are free and a family pass (2 adults and 2 children) costs $67.50. Crank the handles, push the plunger and discover gold at Waihi’s new Gold Discovery Centre. Plus, Waihi Gold Mine Tours takes you ‘inside the fence’ of the massive gold mine where you can get up close to gigantic machines as they work to extract the precious gold and silver. 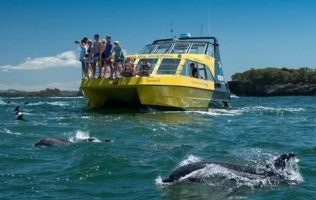 "Pristine coastlines, abundance of marine and bird life, unspoiled native bush and complete tranquillity; with their Full Monty Tour you’ll encounter it all! Visiting stunning beaches, including Lonely Bay, Shakespeare Cliff, Cooks Beach, Hahei and the spectacular Cathedral Cove (where the Chronicles of Narnia and Prince Caspian were filmed), you’ll experience 100% pure natural beauty on all sorts of levels. * Not applicable on the Whirlwind Tour."